MapPhoto above is of a typical morning tea stop. Below are upcoming and recent rides, followed by ride guidelines. Leaving from: The Wheatbridge Cafe, Chesterfield. Meet up over a drink in the cafe 15 minutes before the ride. Click to view the location. 30 Apr Tue - ? 14 May Tue - ? 16 May Thu - ? 21 May Tue - ? 23 May Thu - ? 28 May Tue - ? 30 May Thu - ? 04 June Tue - ? 06 June Thu - ? 11 June Tue - ? 13 June Thu - ? The weekday rides are at present the predominant activity of the club. Taking place during the week, they attract the retired, shift workers and others with time to spare for cycling. Some riders don’t want to be out all day; they will ride to the first cafe stop and then head for home. In summer, riders tend to be back around 5.00pm but it can be later. In winter the ride is shorter with a home time around 4.00pm. Lights are essential at this time. Rides classed as “Touring” pace are in the region of 10mph to12mph depending on terrain; some clubs would class this as steady. We are now building a small group of “Faster” pace riders and we hope that will grow. Rides classed as “Faster” pace are in the region of 14mph to 15mph depending on terrain. This may be the club for you so why not give us a go and just turn up and try a couple of rides. The group meet at the Wheatbridge Cafe, off Dock Walk, Chesterfield S40 2AB. Directions: turn off Boythorpe Rd at Just Tyres, pass the back entrance of Dunelm, then turn first right in front of the brick building with the 1816 plaque. The cafe is on the left after the YMCA New2U building. Wheatbridge Cafe is open for tea and coffee – you can have a full breakfast if you so wish. The toasted fruit loaf is particularly recommended. Please arrive punctually, we do not wait. Phoning riders after the ride has started to find where they are going is discouraged and should only be done in extenuating circumstances. 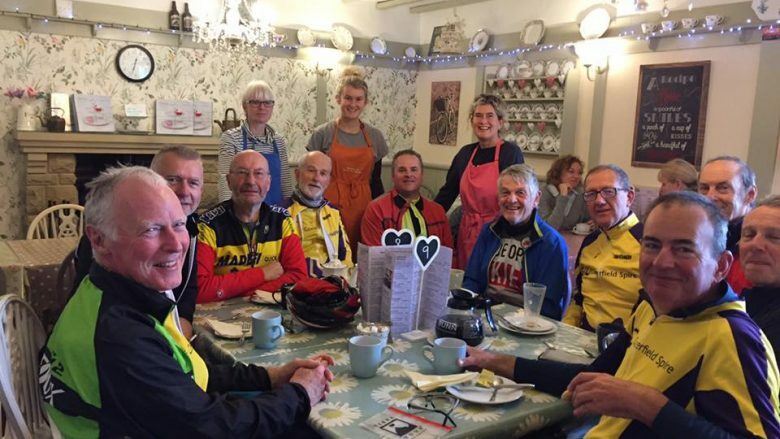 Not everyone rides at the same speed so there will be times when the riders will be split into 2 groups with one group riding at a slightly faster pace than the club norm but probably with the same destination and cafe stops. The same will happen if there is a large number of riders – this is certainly more likely to be the case on good spring and summer days.